Constructed of tubular steel and structural web molded plastic, this Rubbermaid mop bucket wringer is designed with a number of great features, including molded-in wave baffles to reduce splashing and spilling, resulting in less mess and a safer environment for visitors and employees. Equipped with a high-efficiency side press wringer and 35-qt. 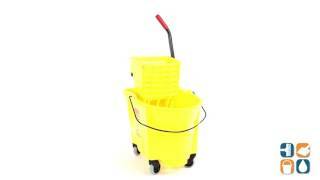 capacity, the Rubbermaid Wavebrake mop bucket with wringer allows you to take on large cleaning tasks with ease. In other words, this mop bucket with wringer combo will last a very long time; over 50,000 wringing cycles! Non-marking casters make for easy maneuverability without damaging floors while the mop handle is able to be secured during transport, preventing damage to walls and doorways. 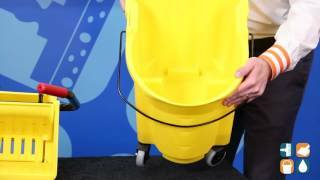 Rubbermaid has been pioneering solutions to provide sanitary maintenance products to consumers since 1968 so you can rest assured you are getting a high quality product when you purchase this Rubbermaid Wavebrake Side Press Mop Wringer Bucket. Why wait? Get yours today! Accepts Rubbermaid Commercial 9C74RED Dirty Water Bucket (sold separately). I use this product with the Rubbermaid Professional Cart for cleaning the house. 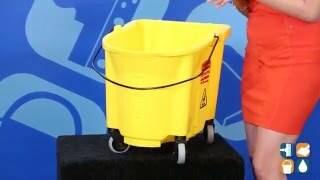 The mop bucket w/Wringer is very good quality and you can leave the wringer behind if it is not needed -- no tools needed.